Start off your visit on the 16th (Sun): pause for some serene contemplation at St John's Cathedral, hunt for treasures at West Side Market, and then try your luck at JACK Cleveland Casino. For other places to visit, more things to do, where to stay, and more tourist information, refer to the Cleveland tour itinerary planner . Detroit to Cleveland is an approximately 3-hour car ride. You can also do a combination of bus and train; or do a combination of bus and flight. In December, daily temperatures in Cleveland can reach 42°F, while at night they dip to 31°F. Wrap up your sightseeing on the 16th (Sun) early enough to travel to Arlington. Kick off your visit on the 17th (Mon): appreciate the extensive heritage of Tomb of the Unknowns, wander the streets of Old Town, and then explore the different monuments and memorials at Arlington National Cemetery. To see maps, traveler tips, other places to visit, and more tourist information, read our Arlington holiday planner. Traveling by combination of flight and subway from Cleveland to Arlington takes 3 hours. Alternatively, you can do a combination of flight, bus, and subway; or drive. Prepare for somewhat warmer weather when traveling from Cleveland in December: high temperatures in Arlington hover around 51°F and lows are around 37°F. Finish your sightseeing early on the 17th (Mon) to allow enough time to drive to Luray. On the 18th (Tue), take a memorable drive along Skyline Drive and then Head underground at Luray Caverns. To find where to stay, photos, other places to visit, and more tourist information, read Luray road trip planning website . Traveling by car from Arlington to Luray takes 2 hours. Alternatively, you can do a combination of subway, bus, and taxi; or do a combination of subway, bus, flight, and taxi. Traveling from Arlington in December, expect little chillier with lows of 32°F in Luray. Wrap up your sightseeing on the 18th (Tue) to allow time to drive to Richmond. Kick off your visit on the 19th (Wed): wander the streets of Carytown, admire the natural beauty at Maymont, then admire the masterpieces at Virginia Museum of Fine Arts, and finally appreciate the extensive heritage of Fan District. For ratings, maps, photos, and more tourist information, go to the Richmond trip planner . Getting from Luray to Richmond by car takes about 3 hours. Other options: do a combination of car and bus; or do a combination of car and train. Expect a daytime high around 54°F in December, and nighttime lows around 35°F. 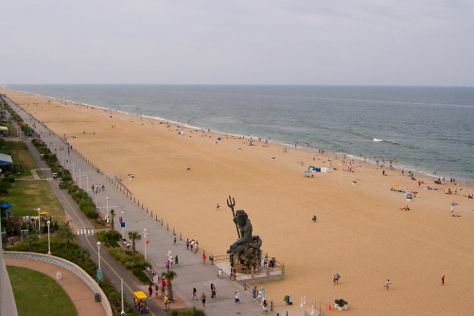 Finish your sightseeing early on the 19th (Wed) so you can drive to Virginia Beach. Start off your visit on the 20th (Thu): kick back and relax at Virginia Beach, then take in the waterfront at Virginia Beach Boardwalk, and then admire the natural beauty at Norfolk Botanical Garden. To see maps, reviews, more things to do, and tourist information, refer to the Virginia Beach trip builder . Drive from Richmond to Virginia Beach in 2 hours. Alternatively, you can take a bus; or take a bus. December in Virginia Beach sees daily highs of 56°F and lows of 39°F at night. Wrap up your sightseeing on the 20th (Thu) to allow time to travel back home.